The Belnord, a landmarked building that occupies an entire block on the Upper West Side has a new listing taking up an entire floor that can be yours for $12,575,000. Residence #1012 is an extraordinary floor-through home offering 5 bedrooms and 4.5 baths generously distributed over a sprawling 3,949 square feet. Beauty abounds with north and south exposures; soaring 10-foot ceilings; fully restored, oversized mahogany windows; and white oak floors with chevron and plank patterns throughout. The residence also features a formal entry foyer and gallery; an eat-in kitchen with Calacatta Gold marble countertops and backsplash, state-of-the-art Gaggenau appliances and a stunning kitchen banquette; and an expansive master suite with two walk-in closets and a spa-like master bathroom with radiant heated floors, custom-designed vanities, a deep soaking tub with separate glass-enclosed shower, and accessories by Kohler, Dornbracht, and Ballista. 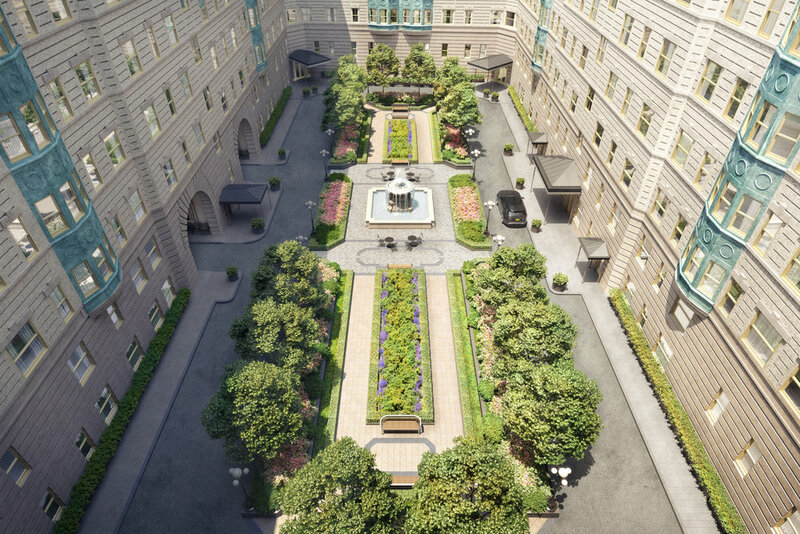 Robert A.M. Stern Architects, is overseeing the restoration of the original architecture and re-imagining the interiors for the residences and is developed by HFZ Capital Group and Westbrook Partners. The Belnord is one of the greatest turn-of-the-century residential buildings, originally constructed in 1908 and designed by famed architecture firm Hiss & Weekes. The property's new design will feature 95 residences, ranging from two- to five-bedrooms, situated across The Belnord's 14 floors. In addition, 9,000 square feet of state-of-the-art amenities will be incorporated into the building, and many of The Belnord's hallmarks - including the courtyard and the exterior architecture - are being restored to their original grandeur and updated.